Da Capo Press, 9780306825255, 336pp. Justin Martin is the author of five books, with his two most recent titles covering Civil War-era subjects. Rebel Souls: Walt Whitman and America's First Bohemians, selected as the outstanding biography of 2014 by the Victoria Society, New York, and as a finalist for the Marfield Prize, was also picked as one of the best books of that year by both the Kansas City Star and Choice magazine. Genius of Place: The Life of Frederick Law Olmsted was also met with many plaudits and glowing reviews nationally. Martin lives with his wife and twin sons in Forest Hills Gardens, New York. "A Fierce Glory accommodates perspectives largely absent from older accounts of the Civil War, including the multi-ethnicity of both armies and the presence in the ranks of several women passing as men." "Almost every angle imaginable on the Civil War has been studied and yet authors continue to bring forth different perspectives. 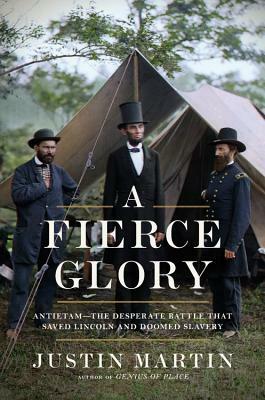 This is the case with Justin Martin's A Fierce Glory...[An] excellent book that looks at the Battle of Antietam from a different angle."